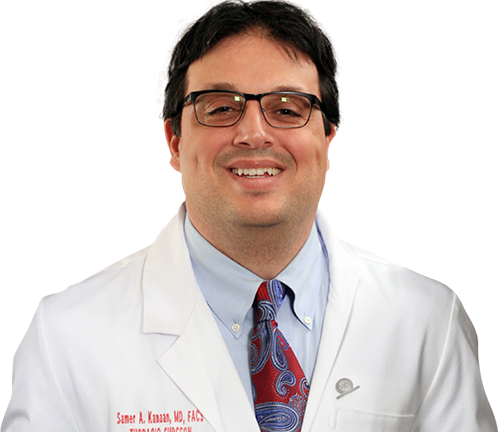 To know more about Samer A. Kanaan, M.D. please click below links. "TGF ß1 Gene Transfer Reduces Acute Allograft Rejection"
Participant in Molecular Testing in NSCLC Advisory Board, Chicago, July 2013. S Kanaan. 2011 Cancer Program Annual Report: Focus on Lung Cancer 2000-2010. Queen of the Valley Medical Center, 2012. S Kanaan. 2011 Cancer Program Annual Report: Focus on Lung Cancer 2000-2010. Santa Rosa Memorial Hospital, 2012. S Kanaan, C Baker, and V Starnes. Resection of Giant Coronary Artery Aneurysms in a Takayasu’s Arteritis Patient. Annals of Thoracic Surgery, 85:1795-1796, 2008. S Kanaan and T DeMeester. Fibrovascular Polyp of the Esophagus Causing Impaired Oxygenation. Diseases of the Esophagus, 20:453-454, 2007. S Kanaan and I Nuno. Atrial Myxoma Presenting as Asthma in Adolescent. Internet Journal of Thoracic and Cardiovascular Surgery, Volume 8, Number 2, 2007. S Kanaan, W Boswell, and J Hagen. Clinical and Radiographic Signs to Early Detection of Lobar Torsion and Subsequent Successful Intervention. Journal of Thoracic and Cardiovascular Surgery, 132: 720-721, 2006. S Kanaan, K Shamsuddin, M Silka, W Wells. Right Ventricular Outflow Tract Resection for Treatment of Refractory Ventricular Tachycardia in a 2-year-old Child. Journal of Thoracic and Cardiovascular Surgery, 130:948-949, 2005. SA Kanaan, BD Kozower, T Suda, N Daddi, T Tagawa, T Mohanakumar, GA Patterson. Intratracheal Adenovirus Mediated Gene Transfer is the Optimal Delivery Route for use in Experimental Lung Transplantation. Journal of Thoracic and Cardiovascular Surgery, 124:1130-1136, 2002. SA Kanaan, T Suda, BD Kozower, N Daddi, T Tagawa, T Mohanakumar, GA Patterson. Intratracheal Adenovirus Mediated Gene Transfer is the Optimal Delivery Route for use in Experimental Lung Transplantation. Surgical Forum, LII:122-123, 2001. SA Kanaan, KM Murayama, LT Merriam, LG Dawes, JB Prystowsky, RV Rege, RJ Joehl. Risk Factors for Conversion of Laparoscopic to Open Cholecystectomy. Journal of Surgical Research, 106:20-24, 2002. LT Merriam, SA Kanaan, LG Dawes, P Angelos, JB Prystowsky, RV Rege, and RJ Joehl. Gangrenous Cholecystitis: Analysis of Risk Factors and Experience with Laparoscopic Cholecystectomy. Surgery, 126:680-686, 1999. BD Kozower, SA Kanaan, SD Cassivi, GA Patterson. Potential for Gene Therapy in Lung Transplantation. Current Opinions of Organ Transplantation, 6:248-252, 2001. N Daddi, SA Kanaan, T Suda, F D’Ovidio, B Kozower, T Tagawa, K Grapperhaus, JH Ritter, T Mohanakumar, GA Patterson. Recipient Intramuscular Administration of Naked Plasmid TGFβ1 Attenuates Lung Graft Reperfusion Injury. Journal of Heart Lung Transplantation, 22:1323-1334, 2003. BD Kozower, SA Kanaan, T Tagawa, T Suda, K Grapperhaus, N Daddi, EC Crouch, CM Doerschuk, and GA Patterson. Intramuscular Gene Transfer of Interleukin-10 Reduces Neutrophil Recruitment and Ameliorates Lung Graft Ischemia-Reperfusion Injury. American Journal of Transplantation, 2:837-842, 2002. T Tagawa, BD Kozower, SA Kanaan, N Daddi, M Muraoka, T Oka, JH Ritter, GA Patterson. Gene Transfer of Tumor Necrosis Factor Inhibitor Improves the Function of Lung Allografts. Journal of Thoracic and Cardiovascular Surgery, 127:1558-1563, 2004. T Tagawa, BD Kozower, SA Kanaan, N Daddi, T Suda, GA Patterson. Tumor Necrosis Factor Inhibitor Gene Transfer Ameliorates Lung Graft Ischemia-Reperfusion Injury. Journal of Thoracic and Cardiovascular Surgery, 126:1147-1154, 2003. BD Kozower, N Daddi, SA Kanaan, T Tagawa, T Suda, GA Patterson. Recipient intramuscular transfection of adenovirus interleukin-10 reduces lung graft ischemia-reperfusion injury. Surgical Forum, LII:120-122, 2001. T Suda, T Tagawa, SA Kanaan, BD Kozower, N Daddi, T Mohanakumar, GA Patterson. Adenovirus Encoding Soluble TNF alpha Receptor Ig Co-transfection Prolongs Gene Expression in Rat Lung. Journal of Thoracic and Cardiovascular Surgery, 126:1155-1161, 2003. T Suda, N Daddi, Tagawa T, SA Kanaan, BD Kozower, JH Ritter, GA Patterson. Recipient Intramuscular Cotransfection of Transforming Growth Factor Beta1 and Interleukin 10 Ameliorates Acute Lung Graft Rejection. Journal of Thoracic and Cardiovascular Surgery, 129:926-931, 2005. N Daddi, T Suda, F D’Ovidio, SA Kanaan, T Tagawa, K Grapperhaus, BD Kozower, JH Ritter, NS Yew, T Mohanakumar, GA Patterson. Recipient Intramuscular Cotransfection of Naked Plasmid TGFβ1 and IL-10 Ameliorates Lung Graft Ischemia-Reperfusion Injury. Journal of Thoracic and Cardiovascular Surgery, 124:259-269, 2002. T Tagawa, T Suda, N Daddi, BD Kozower, SA Kanaan, T Mohanakumar, GA Patterson. Low Dose Endobronchial Gene Transfer Ameliorates Lung Graft Ischemia-Reperfusion Injury. Journal of Thoracic and Cardiovascular Surgery, 123:795-802, 2002. SA Kanaan, KM Murayama, LT Merriam, LG Dawes, JB Prystowsky, RV Rege, and RJ Joehl. Risk Factors for Conversion of Laparoscopic to Open Cholecystectomy. Abstract, Association of VA Surgeons, Twenty-fifth Annual Surgical Symposium, Atlanta, Georgia, May 6, 2001. * Awarded with Best Clinical Presentation. SA Kanaan, T Suda, B Kozower, N Daddi, T Tagawa, T Mohanakumar, and GA Patterson. Intratracheal Adenovirus Mediated Gene Transfer is the optimal Delivery Route for use in Experimental Lung Transplantation. Abstract, American College of Surgeons, Eighty-seventh Clinical Congress, New Orleans, Louisiana, October 10, 2001. Residents Conference, May 5, 2006. LT Merriam, SA Kanaan, LG Dawes, P Angelos, JB Prystowsky, RV Rege, and RJ Joehl. Gangrenous Cholecystitis: Analysis of Risk Factors and Experience with Laparoscopic Cholecystectomy. Abstract, Central Surgical Association, Fifty-sixth Annual Meeting, St. Louis, Missouri, March 5, 1999. BD Kozower, N Daddi, SA Kanaan, T Tagawa, T Suda, GA Patterson. Intramuscular gene transfer of interleukin-10 reduces lung transplant ischemia-reperfusion injury. Abstract, New England Surgical Society, Eighth Annual Research Presentation Day, Boston, Massachussets, May 18, 2001. BD Kozower, N Daddi, SA Kanaan, T Tagawa, T Suda, GA Patterson. Recipient intramuscular transfection of adenovirus interleukin-10 reduces lung graft ischemia-reperfusion injury. Abstract, American College of Surgeons, Eighty-seventh Clinical Congress, New Orleans, Louisiana, October 10, 2001. BD Kozower, TD Sweitzer, SA Kanaan, T Tagawa, SM Albeda, VR Muzykantov, GA Patterson. Vascular Immunotargeting to Lung Graft Endothelium. Abstract, International Society for Heart and Lung Transplantation, Twenty-second Annual Meeting, Washington DC, April 11, 2002. BD Kozower, TD Sweitzer, SA Kanaan, T Tagawa, SM Albeda, VR Muzykantov, GA Patterson. Catalase Immunotargeting Reduces Lung Transplant Ischemia-Reperfusion Injury. Abstract, American College of Surgeons, Eighty-eight Clinical Congress, San Francisco, California, October 8, 2002. N Daddi, T Suda, F D’Ovidio, T Tagawa, B Kozower, SA Kanaan, NS Yew, K Grapperhaus, T Mohanakumar, and GA Patterson. Recipient Intramuscular Cotransfection of Naked Plasmid TGFβ1 and IL-10 Ameliorates Lung Graft Ischemia-Reperfusion Injury. Abstract, American Association of Thoracic Surgery, Eighty-first Annual Meeting, San Diego, California, May 8, 2001. S Kanaan, C Ducko. Diaphramatic Pacing. Harrison's Principles of Internal Medicine, 17th edition, Online, June 18, 2008. S Kanaan, MT Jaklitsch. Pleural Masses. In MI Lewis, RJ McKenna (Eds), Medical Management of the Thoracic Surgery Patient. Philadelphia, PA: Saunders Elsevier, 2009, pp. 432-438. S Kanaan, DA Bambini. (2000), Patent Ductus Arteriosus. In RM Arensman, DA Bambini, PS Almond (Eds. ), Pediatric Surgery. Georgetown, TX: Landes Bioscience, 2000, pp. 352-355. SA Kanaan, BD Kozower, SD Cassivi, GA Patterson. (2001), Gene Therapy for Lung Transplantation. In SM Albeda (Ed. ), Gene Therapy in Lung Disease. New York, NY: Marcel Dekker, September 2002, pp. 457-473. SA Kanaan, MJ Liptay. Acute and Chronic Mediastinal Infections. In TW Shields (Ed. ), General Thoracic Surgery. Philadelphia, PA: Lippincott Williams & Wilkins, October 2004. SA Kanaan. Esophageal Cancer. Department of Surgery Grand Rounds, Northwestern Memorial Hospital, March 23, 2004. Metropolitan Trauma Society, April 14, 2004.